Discussion in 'Broadband and DTH' started by ExcitelOfficial, Feb 26, 2017. I'm here to officially represent Excitel Broadband Pvt. Ltd., a growing ISP in Delhi-NCR and Hyderabad. We vehemently oppose the idea of a fair usage policy (FUP) and based completely on redundant fiber backbone we provide symmetrical connections (as opposed to the ADSL/DOCSIS connections provided by ISPs, in majority). This together with our high speeds are our main fortés and which discernibly distinguishes us from other ISPs. However, being a growing ISP, we strive to focus on resolving the issues that our customers might encounter. That, along with empowering our customers with the knowledge that would assist them in utilizing their internet connections in the most efficient manner possible is the aim that we have in mind with the creation of this official help thread. This thread can be utilized for sharing feedback, for getting advice relating to issues with your internet connection, for queries that new customers might have in mind, questions pertaining to users thinking about opting for obtaining an internet connection from us, for interesting and informational bits of facts and figures and for several other useful reasons which we would eventually figure out in the future. In addition to that, I would post informational / technologically beneficial posts based on personal insight from time to time. Along with this help thread, I could also be contacted at community@excitel.com. You can also directly reach support at support@excitel.com. Is there any feasibility for a new connection in Moulali Area, with Pincode-500 040. Plans look better than my current ISP. Do you give connections in ghatkesar area (pin code 500088) ? That should give a rough idea of the areas that we service in Delhi as well as Hyderabad. Since we have just recently launched our services in Hyderabad, we're expanding at a rapid pace, however, we are not available in the area you described, which can be seen depicted in the online presence map, as well. Same as above, we have not expanded our reach, yet, to your location. However, as mentioned previously, we're expanding rapidly in Hyderabad (and New Delhi, of course), so its always to good idea to refer to the online presence map every now and then. The online presence map is dynamic in nature and is created based off of the inputs by our backend system, which means that its pretty accurate. As a general rule of thumb, coverage can be expected around 1km to each of the points of presence depicted in it. However, you can call our toll-free customer care no. (1-800-419-0616) in case further clarification is required. If you can expand to almost 95% of Hyderabad then Beam aka ACT or any other ISPs will be decimated. They are just exploiting end users by charging 1.3k for 50MBPS with FUP of 150GB. I have been a user of Excitel myself for maybe past 1 year or more. And I am generally satisfied with the service. I speak generally, since there is some ping drops but mostly its a stable connection. I will discuss about this in detail.. but right now I just want to welcome an official rep from Excitel. Thread is made sticky for time being. Any chance you guys are coming to Maharashtra? Using Excitel Since Feb. I had 1 day internet down and some low speed because from some cable problem. Apart from that i used a lot and i mean a lot and had no problem. My usage for Feb was 880 GB. Previously i had MTNL which gave me problem time to time. But really Excitel is Future guyz with those Price plans. When i game i get lowest pings which i never got from mtnl. While downloading going on in Backend it doesn't affect my gaming. I don't know how it happens. The most interesting part is i get double speed in torrents which is 40 mbps (Currently have 20 mbps). Go for it guyz and you won't regret it, well i didn't. We are looking to expand to tens of cities in the next few years. Exact plans would be announced from time to time. We're delighted to see the responses of satisfied customers like you. Focusing on improving and upgrading our services is something we're working hard on, to ensure that we see more of such replies. I'd also like to commend your detailed feedback, in terms of received speeds, used bandwidth and other intricate details such as network performance pertaining to gaming. I've been a user from past Oct 16 and there have been few hiccups in service like downtime of more than 6-8 hr more than twice in a week and frequent disconnections in between. 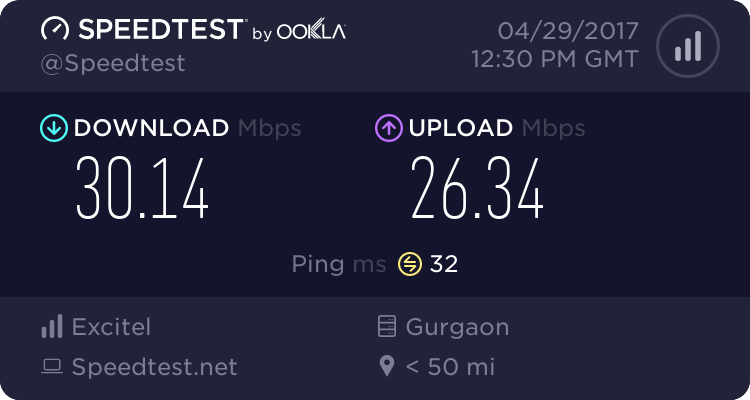 Sometimes my 4g Jio / Airtel provides better smooth experience while online gaming than excitel but they make up for it with their awesome plans and have no fup really. During my first month i used up more than 800 gb lol... now averaging at around 200 gb / month. I'm fairly satisfied but i'd give suggestion to improve the jitters / lag i face while online gaming and the new revamped my.excitel.com dashboard doesn't have total usage quota as it had previously which is a bummer. Not that it concerns much , but having that same feature makes us feel good about crunching GB's. I'd still give you guys a thumbs up for good speeds and no fup and good local cable support. Thanks for the detailed feedback. We are focusing heavily on improving the stability of the internet connections of our users. I feel this is the most important aspect, since we're not just focusing on expansion, alone, but also on the quality of the connection, as perceived by the customer. the new revamped my.excitel.com dashboard doesn't have total usage quota as it had previously which is a bummer. Not that it concerns much , but having that same feature makes us feel good about crunching GB's. I've seen quite a few of our users ask about the data usage details feature. We will address this soon. and I'd still give you guys a thumbs up for good speeds and no fup and good local cable support. Good news! We already had an android app, but now we have an official app counterpart for iOS as well! (8) Pre-pay for future months of service! Good News! We now have our peering technology setup to work with another platform ... Netflix! This would be a great news, since it provides for a fast and smooth experience with regards to watching tv shows, movies and the like in the highest quality provided by Netflix, and, with the added advantage of never having to bother with pointless "Fair Usage Limits". We would appreciate feedback relating to the perceived Netflix experience of our users. This would help to ensure the proper delivery of content from Netflix to our users (via peering) and help us in finding ways of improving the same. Feedback augmented with screenshots and the like, would be great. Does this peering extends towards other streaming sites like Amazon Prime, Vimeo etc? Not that I face any issues while watching shows on Amazon prime tho (that too in full HD).. just asking. No. We work on establishing our peering technology to work with various platforms, individually. For the two specific platforms that you asked about, i.e. Amazon Prime and Vimeo ... we don't have peering established with those platforms, as of yet. However, adding new platforms to our peering efforts is one of the most important priorities for us. Therefore, rest assured, we're going to see new platforms utilizing our peering technology in the near future. Are you guyz planning to provide more affordable speed in near future as jio is coming soon in Delhi? We had initially started out with 4 Mbps, which was increased to 5 Mbps => 10 Mbps and finally, 20 Mbps, which it is currently, as far as the base package is concerned. We have been regularly updating our plans in the past and we would continue the same in the future, as well. And...... you guyz did it again. from 20 to now 40 mbps. Thanks a lot. I didn't realize they did. While I am getting 40 mbps on Excitel server, on other server I am getting about 30 mbps. Still, its MORE than what I bargained for. Faster than 96% of India. HELL YEAH! This is an important day to remember - because this is the FIRST TIME in India, that a truly unlimited (NO FUPs) 100 Mbps plan goes under thousand rupees! We started with a 4 Mbps base package. It was upgraded to 5 Mbps, then, to 10 Mbps and subsequently, to 20 Mbps. Keeping in line with our motive of upgrading our plans on a regular basis, we are pleased to announce our new revolutionary plans! Only this time, its a massive change which is sure to get you EXCITED! * Speeds on all packages have been increased! * Regarding our second and third package, we have greatly reduced the prices for them. * Internet and Peering speeds have been merged in one blended speed, regardless of the source of traffic or destination. Yes, that's right. Your eyes are not deceiving you today. Our customers can enjoy the experience of a high speed 100 Mbps NO-FUP connection! This is a major breakthrough, we feel, since it puts internet users on the forefront of a high speed internet usage experience WITHOUT an accompanying, annoying "usage limit", which, until now has only been a dream. "100 Mbps packages" have been advertised by other ISPs as well, so one might ask, what different are we offering here? As far as high speed packages are concerned, although ISPs have been advertising such plans, they have been enforcing ridiculous FUPs (Fair Usage Policies), along with placing such plans into a price range, which would render it unreachable and impractical for the general public. By means of these nefarious tactics, ISPs are able to restrict users from ever using those so called "100 Mbps" plans, in reality. Furthermore, such ISPs also charge more money from the user once their usage has exceeded the "FUP quota" while using such plans. "Its like selling a Mercedes to a customer, but telling them that they can ride it for just 1 day in a month." We're here to finally change that, with the revolutionary upgrades to our packages. Join the truly unlimited, 100 Mbps, high speed internet experience! Spread the word, and help friends, family and relatives enjoy the experience of using a high-speed, unrestricted, 100 Mbps internet connection.